British mathematician Alan Turing has left a legacy full of incredible highs, and yet his last years were a tremendous low. 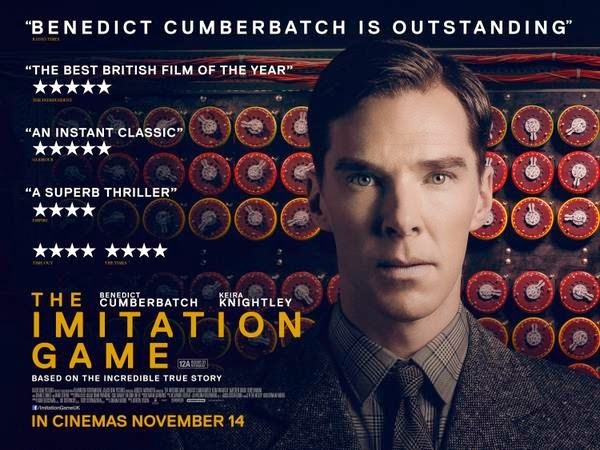 'The Imitation Game' (★★★★) intertwines Turing's life at boarding school, his key role in the decryption of the German Enigma code during WWII, and the eventual persecution stemming from his homosexuality. Benedict Cumberbatch stars in the lead role, with some obvious parallels to the great Sherlock Holmes. Of course, Holmes was merely a literary creation whereas 'The Imitation Game' is based on the Turing's real life story, one which had not yet been committed to the big screen. 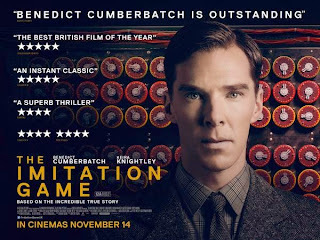 Morten Tyldum's biopic arguably does justice to the great man, capturing the triumphs and frustrations of Turing's life, with strong supporting turns - notably, and perhaps surprisingly, from Keira Knightley who frequently matches Cumberbatch's emotive central performance. Unfortunately, there's not that much to 'Hello Carter' (★★), a London-based comedic caper from frequent assistant director ('Layer Cake', 'Hot Fuzz') turned first-time feature helmer Anthony Wilcox. Although that doesn't mean that the film isn't without some merit, including its SBTRKT-heavy soundtrack, and the occasionally witty line from Wilcox's script. 'Hello Carter' sees Charlie Cox ('Stardust') as the unemployed Carter, pining after his ex, and without a place of his own to stay. He bumps into his ex's brother on the tube, setting into a motion a series of somewhat bizarre and slightly criminal events. 'Hello Carter' never quite gets going in the drama stakes, settling into more of a romantic comedy, and the result is a solid yet unremarkable effort that may have been better suited to television. In a double whammy of unconventional cinema, 'Goodbye To Language' and 'The Congress' hit the UK on DVD and Blu-ray. The former is legendary auteur Jean-Luc Godard's latest and most experimental work, while 'The Congress' adopts the vivid visual style of Ari Folman's previous film 'Waltz With Bashir'. Godard's foray into 3D with 'Goodbye To Language' is often mesmerising (and equally, headache-inducing) but its haphazard narrative is painful and the film feels like an unrewarding challenge. 'The Congress' has more of an engaging storyline, postulating the future of cinema, before metamorphosing into something of a Studio Ghibli animation. Read more about the film from On Camera #7, where 'Sin City 2' was also reviewed - another new home release. The Golden Globe award nominations have just been announced, with 'Birdman' leading the way with seven nods, closely trailed by 'Boyhood' and the aforementioned 'The Imitation Game' with five each. On the TV side, 'Fargo' led the nominations, with 'True Detective' close behind. Read the full list at goldenglobes.com. The announcement of the new Bond film, SPECTRE, was also greeted with several bits of casting news with Christoph Waltz, Lea Seydoux, Andrew Scott, and Monica Belluci all confirmed for roles alongside the returning Daniel Craig. Excitingly, DoP Hoyte van Hoytema ('Let The Right One In', 'Interstellar') is also onboard. Olivia Colman and David Tennant return for the second series of 'Broadchurch', airing from 5th January on ITV. Watch the official trailer at YouTube.